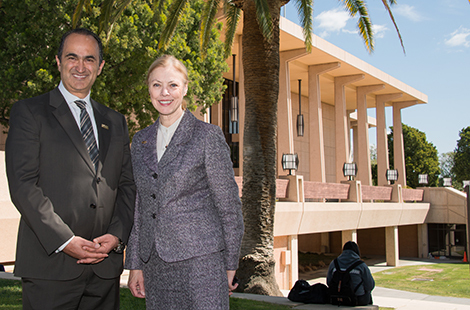 CSUN’s College of Business and Economics proudly announced that alumnus David Nazarian ’82 has pledged to lead a $25 million fundraising drive and launched that effort with a $10 million cash gift. In recognition of his gift and pledge of continued support, CSUN has named its college of business the David Nazarian College of Business and Economics. Read more about the announcement. The 29th Annual International Technology and Persons with Disabilities Conference, or CSUN Conference, took over San Diego recently, bringing the latest in assistive technology to conference participants, including musician Stevie Wonder. Read more about the conference. Parents and educators regularly lament the amount of sleep today’s teenagers get. Throw in overt or even subtle forms of racial and ethnic discrimination, and a good night’s sleep can become even harder for minority teens. Read more about the study. Fri., April 4, 4 p.m.
Fri., April 11, 12 p.m. Sun., April 13 at 3, 4:30 p.m.
Students, faculty and staff attended the Creative Expression for Health, Healing and Social Justice event that addressed issues facing college-aged women and men and highlighted ways in which health, healing and social change manifest through creative expressions. More than 500 people attended the fifth-annual Water Day event hosted by the Institute for Sustainability in honor of World Water Day on Wednesday, March 19. Cameron M. Smith, a prehistorian, will examine how research is changing understanding of the evolutionary process and opening doors for new fields of study — from DNA repair to cultural evolution — as part of CSUN’s Richard W. Smith Lecture Series on Thursday, April 3.